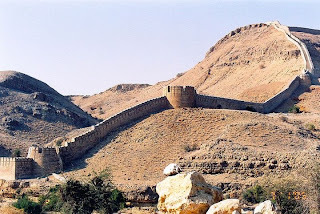 RaniKot, The Great Wall of Sindh also known as Deware Sindh in sindhi language is the world's largest fort with a circumference of about 26 km or 16 miles. Since 1993, it has been on the list of tentative UNESCO World Heritage Sites. 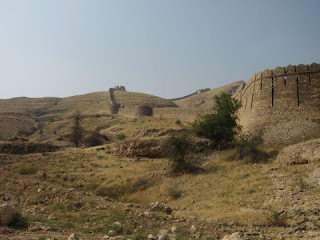 Ranikot is the most talismanic wonder of Sindh. Visible from five kilometers away its massive undulating walls twist and dip over the hills. With the circumference of more than twenty nine kilometers, its walls, built with dressed sandstone and reinforced with 45 bastions along the outer wall, of which 7 are rectangular and the remaining are round. All modified through the ages to accommodate the use of gunpowder, this perhaps makes it the largest fort in the world. “It stands in the middle of nowhere, defending nothing" writes Isobel Shaw. 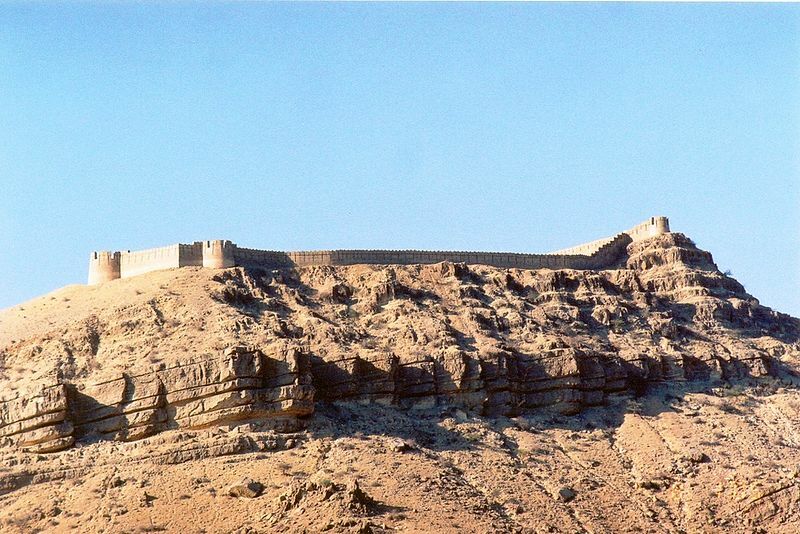 So why was this fort built here in the desolate terrain of the Kirthar range? Many theories have been developed to answer this question. According to Ishtiaq Ansari, the Talpurs had sent their families to Thar and Kachchh when Afsharids attacked Sindh during the times of Kalhoras. However, after acquiring the rule of Sindh, they wanted a safe and secure place where they can send their families during the troubled times. This might have prompted them to rebuild this fort to their needs. Rahimdad Khan Molai Sheedai holds view that its location in Kohistan on the western frontiers of Sindh gave it its strategic value. Whereas Mazher Ansari is of the opinion that, it was first constructed in the Achaemenid Dynasty of the Persian Empire (550 - 330 BC). As this empire stretched from Turkey in the west, where a similar wall is constructed near the Caspian Sea called The Great Wall of Gorgan, which is 155 km in length and to the east up to River Indus in Sindh, where this majestic fort is located. 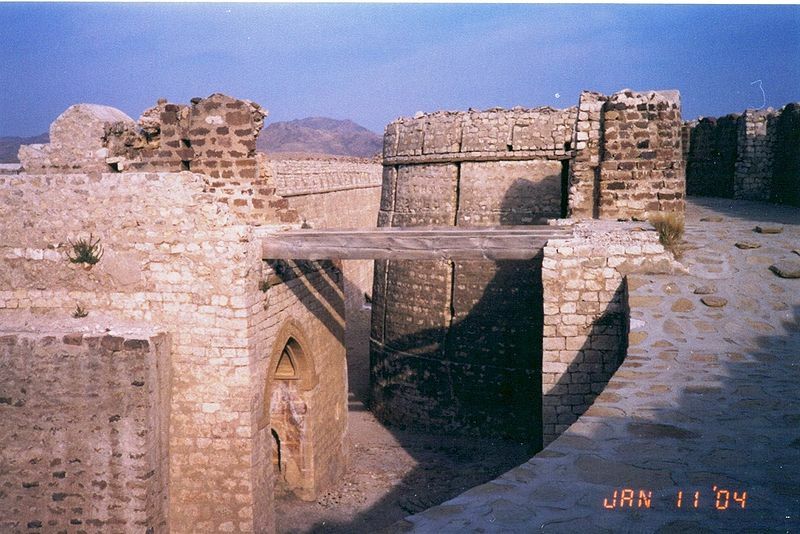 This enchanted fort is located in Lakki Mountains of the Kirthar range on the right side of the mighty River Indus at a distance of about 30 kilometers from the present day town of Sann. A mountainous ridge, 'Karo Takkar'(Black Hill), running north to south, forms its western boundary and the 'Lundi Hills' forms its eastern boundary. 'Mohan Nai', a rain-stream enters the fort from western 'Mohan Gate', where it is guarded by a small fortification, changes its name to 'Reni' or 'Rani Nai' or rain-stream and gives the fort its name. 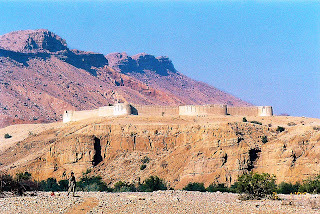 Ranikot is thus the 'fort of a rain stream' - Rani. It runs through it, tumbles in a series of turquoise pools to irrigate fields and leaves the fort from its most used 'Sann Gate' on the eastern side. Most of the twenty nine kilometers long wall is made of natural cliffs and barricades of mountainous rocks which at places rise as high as two thousand feet above sea level! Only about 8 km portions of its wall are man-made, built with yellow sandstone. 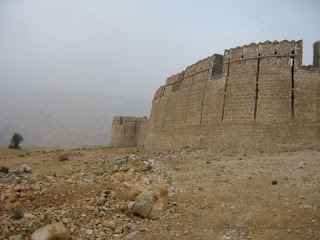 As one enters the fort, one can find hills, valleys, streams, ditches, ponds, pools, fossils, building structure, bastions, watchtowers, ammunition depots, fortresses - all inside the Ranikot, adding more to its beauty and mystery. A spring emerging from an underground water source near the Mohan Gate is named as 'Parryen jo Tarr' (the spring of fairies). According to a tale told by the local inhabitants, fairies come from far and wide on the Ponam Nights (full moon) to take bath at this spring near 'Karo Jabal' Splashing sounds of water falling on the rocks can be heard at another spring, 'Waggun jo Tarr' or the Crocodile Spring, named so as crocodiles once lived there. Within Ranikot, there are two more forts - Meeri and Shergarh fortresses. Meerikot takes its name from the word 'Mir' meaning top (for instance the top of a hill, chief of any baloch tribe, etc.). Both the main Ranikot and the inner Meerikot have similar entrances - curved, angulated with a safe tortuous path. From the military point of view, Meerikot is located at a very safe and central place in the very heart of the Ranikot with residential arrangements including a water-well. 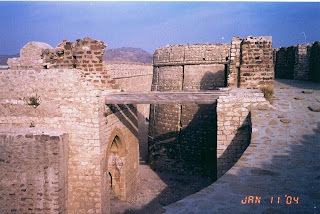 Talpur Mirs used Meerikot as their fortified residence. One can explore ruins of the court, harem, guest rooms, and soldiers quarters inside it. 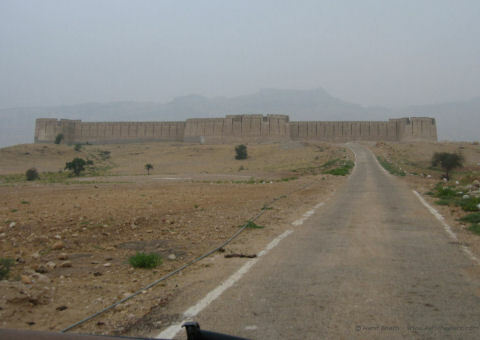 Its 1435 feet long wall has five bastions. Every structure in the Ranikot has its own uniqueness and beauty. Looking up from Meerikot one can find another fortified citadel - Shergarh (Abode of Lions) built with whitish stone. Though its location at 1480 feet above the sea level makes this fortress a unique structure, it also makes it equally difficult for supply of water, which can only be had from the brooks and rain streams, hundreds of feet below! The steep climb upto Shergarh gives a commanding view down over the whole fort and its entrance and exit points. On a clear day one can even see Indus, 37 kilometers away to the east. Beside the Mohan Gate and the Sann Gate, there two more gates, rather pseudo gates. One is towards the side of ancient town of Amri. This 'gate' is called the 'Amri Gate'. The breach in fort wall due to the river stream has been referred as a gate. Similarly, the Shahpir Gate to the south also appears to be a pseudo gate taking its name from a limestone rock with a rough shape of foot imprinted on it. The sacred footprint supposedly belongs to Hazrat Ali (R.A) or some other religious personality and is venerated by locals. 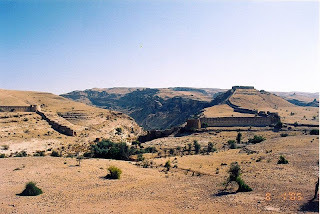 It seems to be a later breach in the fort wall instead of a formal gate because one can't find any bastion or watchtower or their remains at the site, needed to guard any formal entrance or exit points. One of the three graveyards has about four hundred graves made of Chowkundi like sandstone with engraved motifs of sunflowers and peacocks. Whether we can call them as theriomorphic and phytomorphic motifs are an open question. Another one appears to be a graveyard of Arabs. The third one, about a mile away from the Sann Gate, had sixteen or seventeen graves earlier but now there are only four graves. The local inhabitants call it the Roman's graveyard. Currently, only the Gabol Baloch tribe occupies the area within Ranikot. The area has become a virtual village for the Gabol's over the past century who earn their livelihood by offering tours to many of the visitors, as well as by small scale farming. Today, the Gabol tribe chiefNabil Gabol is trying to attract the Sindh government's funds to develop the area into an international tourist site.